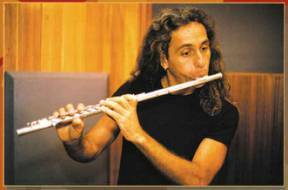 Flautist, composer and arranger, born in Brasília, graduated in Flute and Music at the University of Brasilia. His performance in the musical scene in Brasilia is remarkable, being a member of several groups, such as Liga Tripa and Pé de Vento. Apart from being part of Alma Brasileira Trio, he is a professor at the Escola de Música de Brasília (Music School of Brasilia) and also composes jingles and soundtracks for theatre plays and videos.